2018-11-27 Last Sunday, November 26, 2018, Caio Induscar and Busscar, bus manufacturers belonging to the Caio Group, participated in the 12th edition of the Bus Brasil Fest – The Classic and Modern Buses Fair, held at Charles Miller Square, in the Pacaembu Stadium in the capital of São Paulo. Considered one of the largest bus exhibitions in Latin America, BBF brought together the general public, the specialized press, bus admirers and 120 exhibitors, among them bus manufacturers and urban and road transport companies as well as private collectors. They provided the opportunity for 20 thousand visitors to make a true journey through the history and evolution of Brazilian collective transportation. In this edition of the event, 175 buses were shown, of which approximately 30% were old vehicles and the others current models. In addition to the design and beauty inherent in all vehicles, it was possible to compare how the old and modern buses differ: comfort for the driver and passengers; handling; safety; accessibility; technology; among others. BBF also demonstrated the evolution of the Caio brand`s more than 72-year history with the classics exhibition such as the Gabriela, Vitória, and the modern urban Millennium BRT. All generations of Apache VIP, Brazil`s best-selling urban model, were also on display. 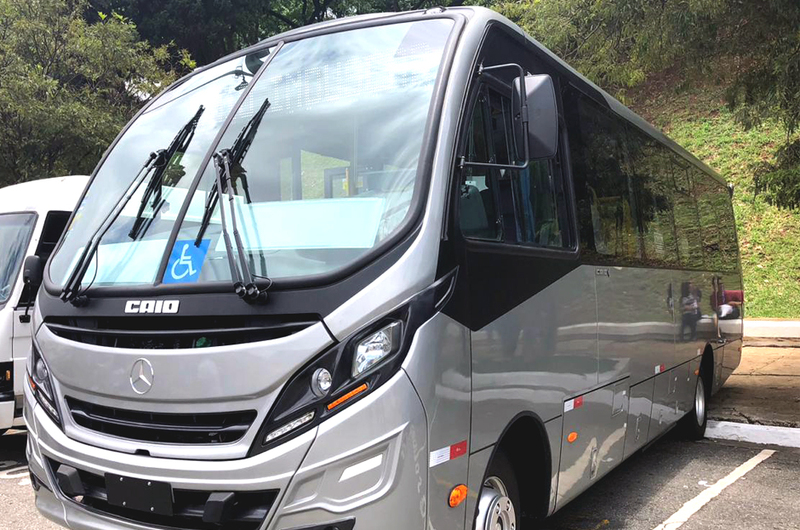 One of the sponsors of the event, Caio Induscar, exhibited the F2400, urban version, a model that exemplifies the most modern in design and technology in the micro segment, combining operational advantages to customers to items that provide comfort and safety to passengers. Bus enthusiasts could also check out iconic Busscar models, such as JumBuss 340 and VisstaBuss. For the event, the brand that effectively returned to the market in 2018, exhibited one of its launches, the VisstaBuss 340. A bus vehicle that represents a genuine Busscar bus, which has high quality and sophistication, adding modernity in items of embedded technology, exquisite finishes, easy maintenance and spare parts. Participating in events that highlight the importance of the bus at different times in history, and encouraging the use of modal as a priority means of transportation, is a great satisfaction for Caio Induscar and Busscar.